This is my first blog post, so excited! I have contributed to many social media platforms over the years but it never occurred to me to start my own blog as I am not a natural writer. Nonetheless, I feel today will be a good day to start my blog (a day before my birthday) to write about things I love – design, travel and enjoy life in general, which presumably everyone loves too. Architect by training, I have worked on the interior design of several high-end residential and hotel projects over the years in both Europe and Asia. Architecture is one of those jobs you can’t just switch off from, its around you all the time, everyday and everywhere. Because of what I do, I can stare at a building or an interior for awhile to study the details, critique in my mind and gather inspirations for my next project. It is a common “occupational disease” for an architect or a designer. I love to travel to see buildings around the world and experience them first-hand, it makes me appreciate what the architects want us to experience in their vision and grand scheme. Whenever I travel, I prefer booking into design hotels to experience something different than the bog-standard chain hotels (Although after going to a few, I do see the merits of chain hotels which I will elaborate in another post). Some design hotels are more successful than the others and by that, I mean the whole package – hotel’s architecture and details, quality of construction, quality of operation and service, down to the quality of amenities on your vanity top. 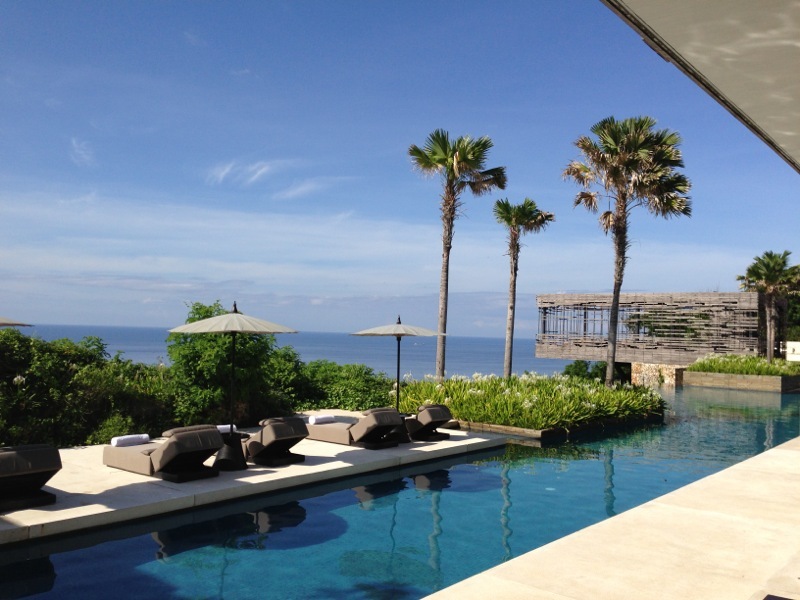 One of my most favourite design hotels is Alila Uluwatu. 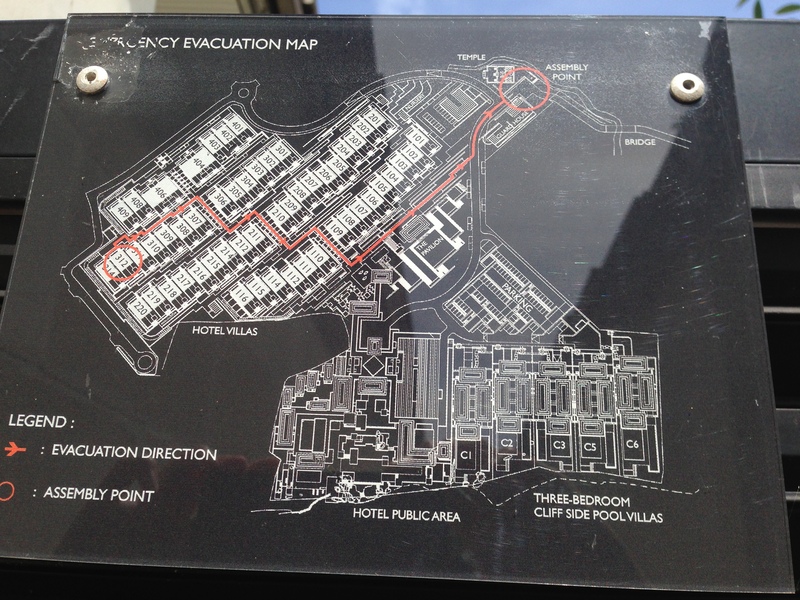 I visited this heavenly resort in December 2013 with my then-boyfriend-now-husband :). Upon arrival, you enter the doors to paradise through an open reception area overlooking the Indian Ocean and its bright blue sky above. The scenery is breath-taking and its not one that could be forgotten easily. 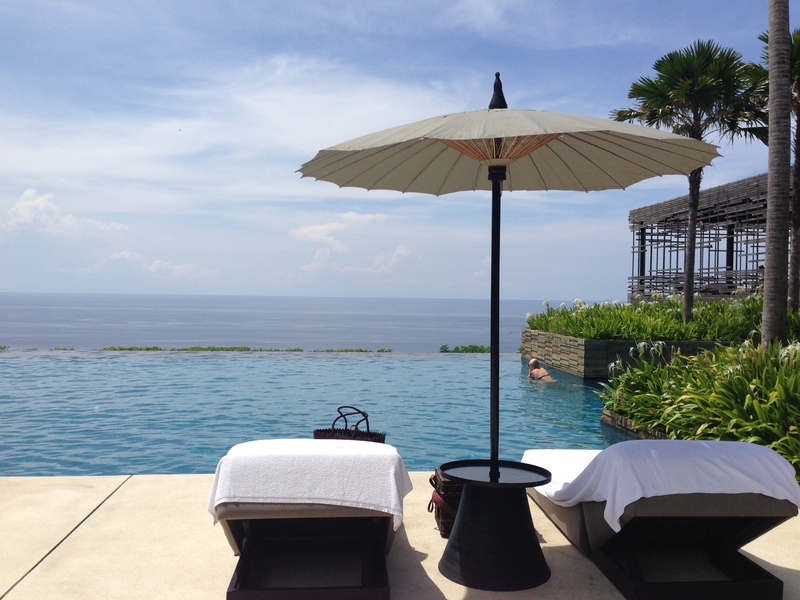 The hotel grounds cover a vast area, with pool villas planted in rows and terracing down towards the sea cliff. There are two restaurants on either side of the reception pavilion, facing onto the infinity pool and its signature sunset cabana. 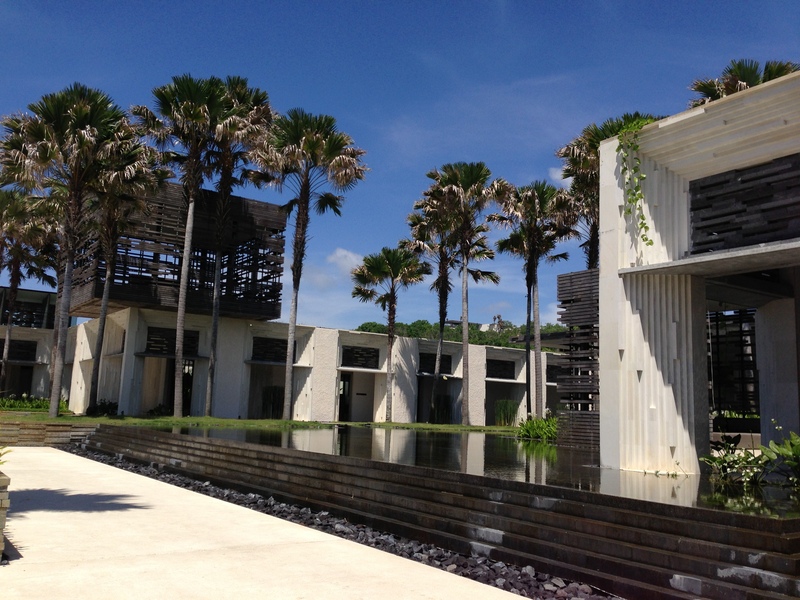 To the side of the main building, there’re a gym, a yoga pavilion, a library, a shop and a spa. 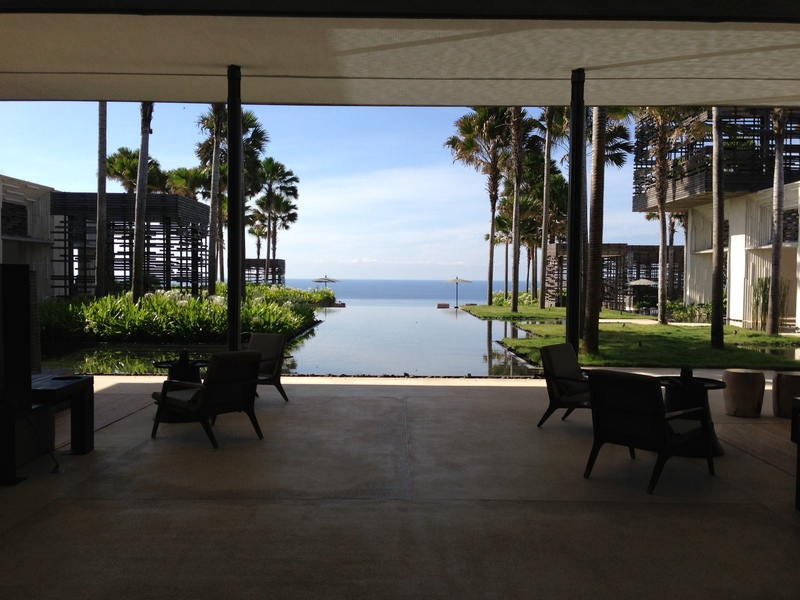 We stayed in a One bedroom Pool Villa (Rm 312) which is almost at the top of the hotel premise. Because of the cascading layout of the villas, I would recommend asking for a villa along the top two rows (3xx, 4xx) so you can avoid being overlooked at by other villas, especially if you intend to do a lot of sunbathing on your pool deck. 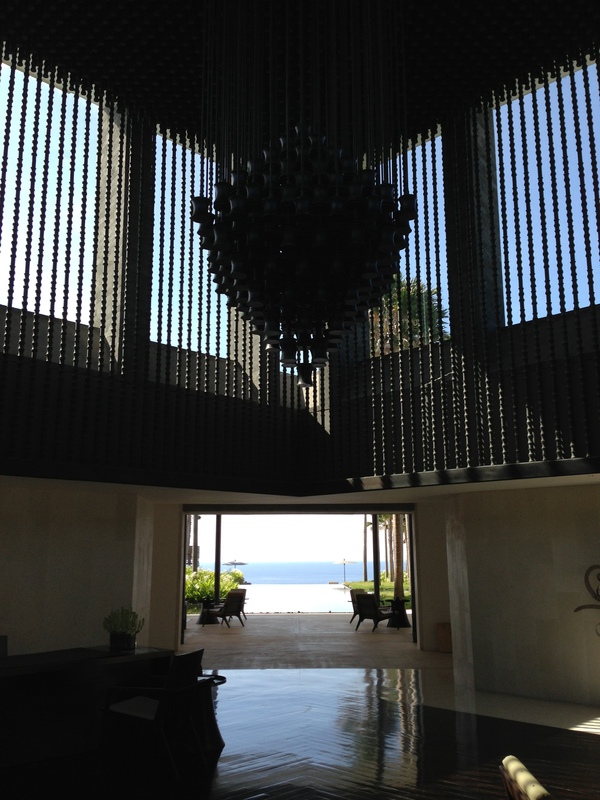 What I love about this hotel is its architecture and the way it relates to its surrounding. 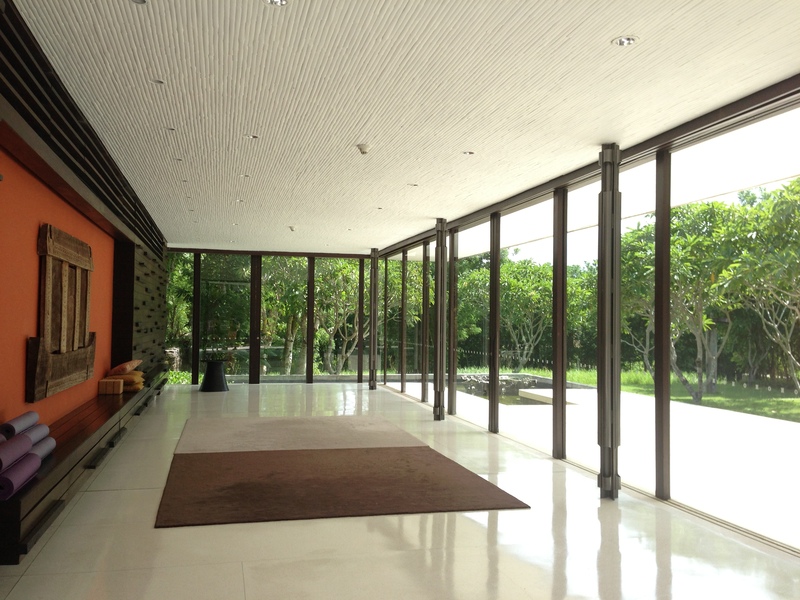 I first came across this hotel through my regular architecture newsfeed Archdaily. 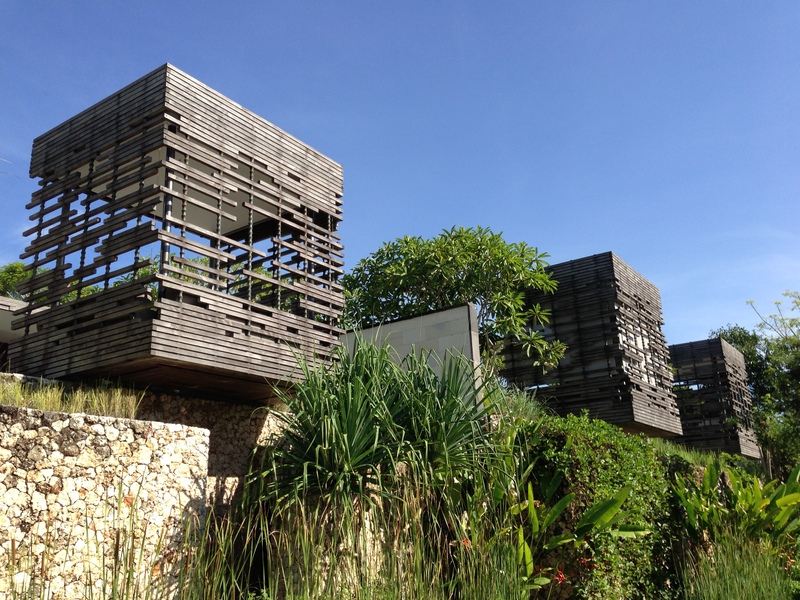 The terracing layout is purposeful and respects its surrounding context. From afar, the low lying buildings with roofs made of Balinese volcanic pumice rock neatly nestle themselves in the deep forest of green. Apart from reflecting the heat off the hotel grounds, the beige limestone (sourced locally) has also been used to create a signature architectural detail to this project. 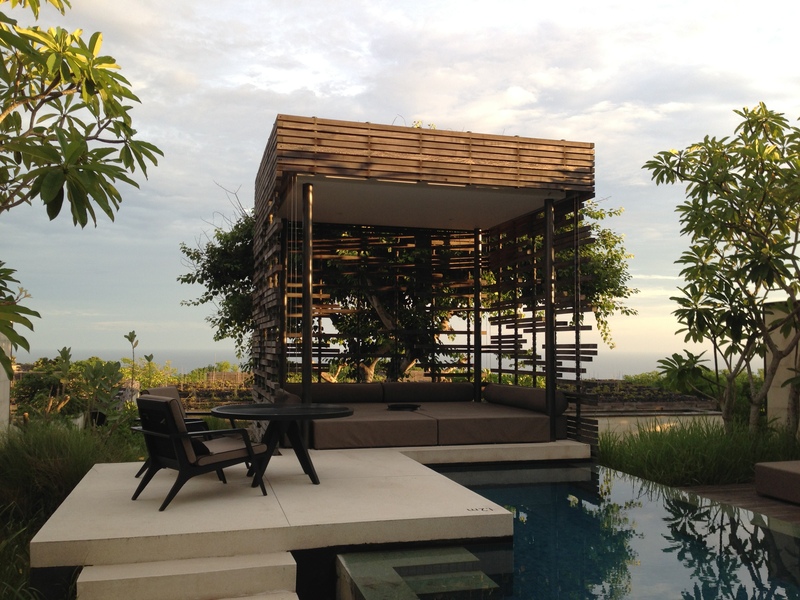 The sunset cabana is the other architectural feature of this project. Its deconstructed style of a cabana is unique. 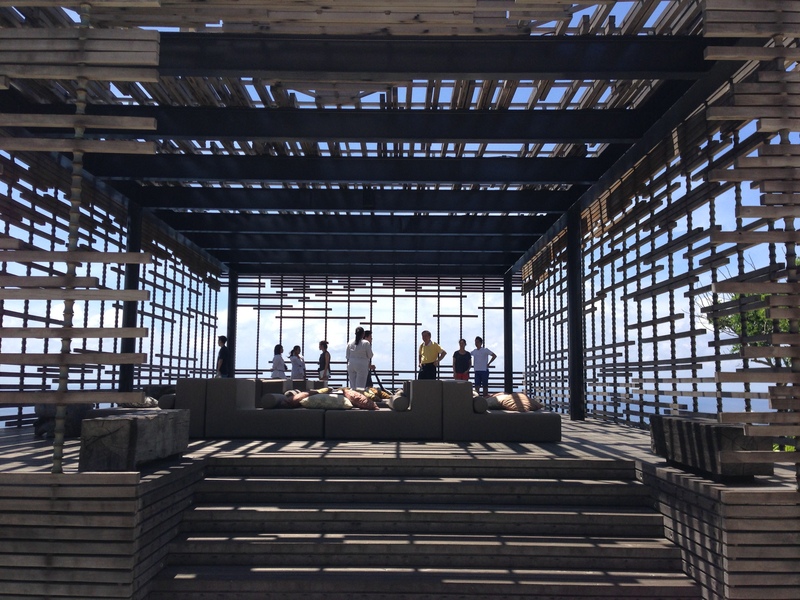 It looks haphazard and shabby at first but if you look up close, the vertical substructure of the cabana holding up the plinths of timber is actually made of oxidized brass/bronze tubings in the shape of bamboo sections. These two main features and details are replicated across the project which made the design concept much more pure and strong. All villas in this hotel have their own private pool, its about 1.5m deep which makes it more swimmable than your normal plunge pool. The one bedroom villa is extremely spacious (290 m2 inc. pool deck) with a king size bed, a day bed, lounge seating and work desk, walk-in shower, double vanity, large tub, separate WC and an outdoor shower. I am a big sucker for hotel amenities (where I hide them before housekeeping comes so they give you more and I can take more of them home, muahaha) and Alila does not disappoint! Aside from the usuals, they have their own bottles of suntan oil, insect repellent, pillow mist and cooling gel. These are all very thoughtful details which makes Alila stand out from the others. Each of these bottles smells incredible and we ended up buying a tub of bath salt and a bottle of massage oil (which smells divine). We’re still using those products today and each time we open the bottle, it takes us back to this paradise. Impeccable, very caring but not intrusive. Our butler was also very helpful in providing local information and organising a car for our day tour to nearby areas. As I mentioned, there are two restaurants in the resort: The Warung which serves Balinese/Indonesian cuisine and Cire which was serving Mediterranean cuisine when we visited (it has since changed to East-Asian Cuisine according to the website). Warung was not bad for a hotel restaurant however was not outstandingly authentic during our visit. We only had dinner there the first night and decided to venture out to different places for the rest of our stay. 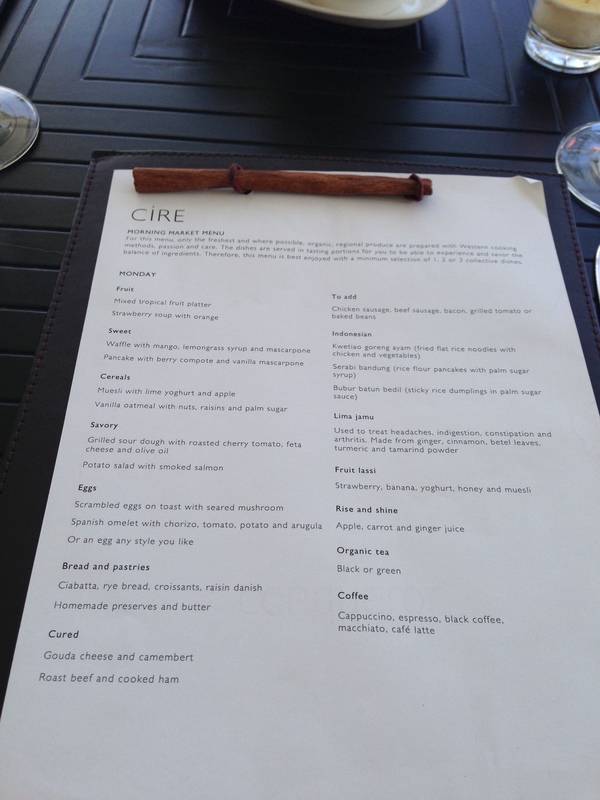 We didn’t get to try Cire at night, however our breakfasts are served there. The breakfast menu changes everyday which was refreshing. 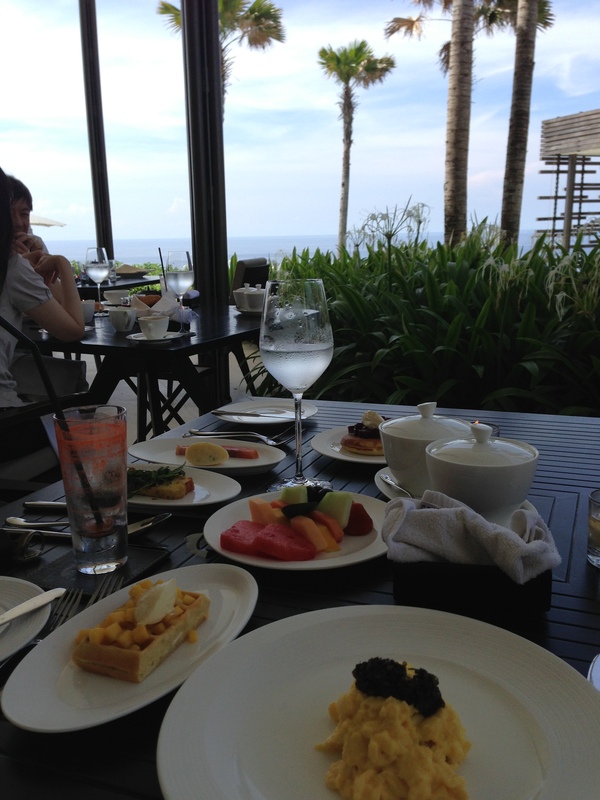 The quality of breakfast was not bad, but again not outstanding. Nonetheless, the view compensates for it and in the land with an abundance of fruits, we drank as many juices and ate as much fruits as our bellies can take. Uluwatu is about 1 hr car ride from the Denpasar Airport and the traffic is horrendous due to peak season (Christmas) and poor infrastructure (not sure if it has improved by now). It was our first time in Bali and we wanted to see Ubud. It was a mistake as we spent about 4 hrs in the car travelling back and forth which was a waste of time – we could have chilled by our nice pool instead. So spare lots of travel time and plan ahead your itinerary, work out what you want to see and do. If you head out during the morning, its best to spend the whole day out because going back to the hotel during the day with the traffic is not worth it. 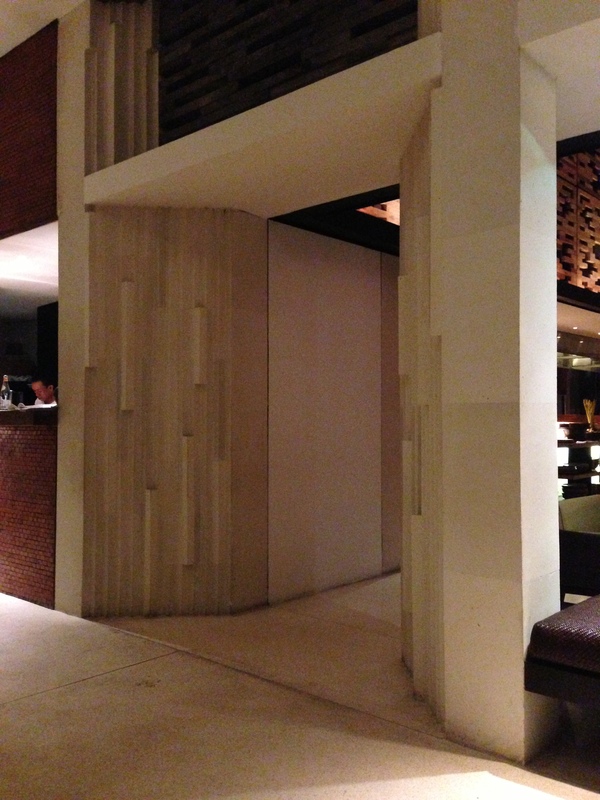 For foodies, its worth visiting Il Ristorante at the Bulgari Hotel which is not far from Alila. Naughty Nuris in Semiyak is a must-try, their BBQ pork ribs are out-of-this-world. Will I stay there again? YES MOST DEFINITELY – perhaps for a special occasion as the hotel is not an everyday-affordable place. Thanks Jennie for your kind words! It was quite expensive, we went during Christmas which was peak season and it was about 600USD per night. It’s definitely a place to go for a special occasion 🙂 Check Hotels.com – they do quite good deals sometimes. Thanks! Hoping to contribute more in the bloggosphere! Wow beautiful hotel, am going to have to go there! Congrats on your first post! 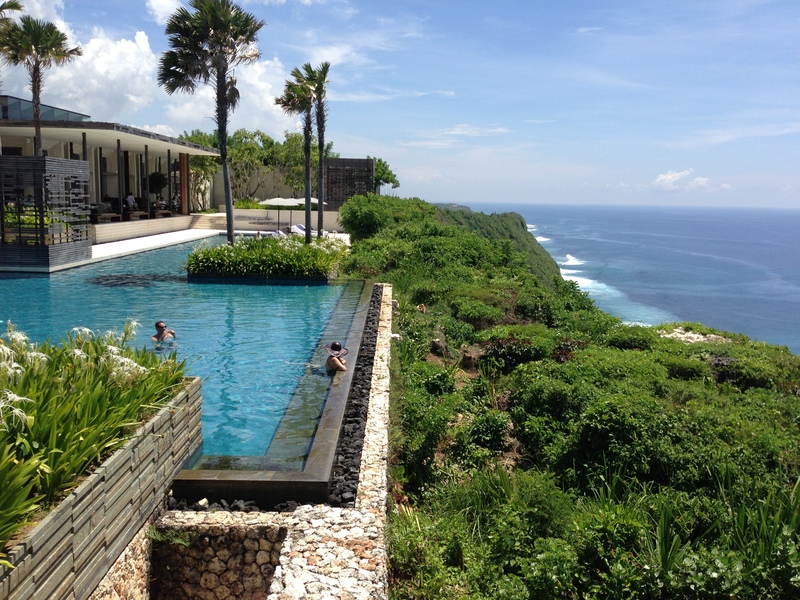 I’ve heard many good things about Alila Uluwatu and it’s great to read some of the details of the hotel’s design and its services. The insect repellent and suntan spray make for a nice touch.